When I get to thinking about the state of school lunches in this country, it makes me despair, just a bit. I know it's a well-worn subject, but lately I've been thinking that it all boils down to one simple question. Why do we serve our children the kind of food that none of us would willingly eat ourselves? I'm sure there's more to the situation that meets the eye, that simple economics play a huge role, and that there are millions of people in this country with differing opinions on why America's children are fed slop. (And there is no other word for it - well, no other polite one at least. That's something we can probably all agree on.) I also know this discussion is considered a luxury by many, many people who populate this earth, but that doesn't mean it isn't a problem we need to solve. Goodness, I'm starting off seriously, aren't I? It's just that as I stood over the stove last night, boiling cabbage leaves and stewing tomatoes, the familiar rolls of meat-stuffed cabbage reminded me of the wholesome lunches I was fed at my school in Berlin (a public school, I'd like to point out). From stuffed cabbage to Sauerbraten to chicken fricassee, school lunch was a meal we ate with gusto. Freshly prepared by grumpy ladies in white hats, dolloped out onto trays with bread and fruit, and costing a little less than five Deutschmark per lunch (which, if my memory and mathematics are correct, would be around $2.00 in today's dollars, though I'm sure my father will correct me if I'm wrong), this was good, honest food. Sure, the older we got, the more we thought the doner kebaps down the street were a way better use of our lunch money and besides, eating in the lunchroom with seventh graders seemed, like, totally out of the question by the time the twelfth grade rolled around, but still, that lunchroom nourished thousands of kids, from kindergarten all the way to the end of the line, and with very little protest. As a result of all those years standing in line with my classmates, fiddling with the blue plastic lunch chips that countless others before us had used (our parents paid the lunch fees in advance, on a sliding scale according to income, and we were given a sack of chips doled out at the beginning of each month. The chips were taken at each meal by the lunch ladies, then counted, and recycled back to us. ), stuffed cabbage reminds me of my happy days in Berlin. This week, the Los Angeles Times reprinted a recipe from 2001 for a lamb-filled version, and since my recipe-clipping only goes back to 2002, I jumped at the chance to try this. It seemed simple enough - a ground lamb stuffing with toasted pine nuts, chopped cilanparsley, cumin, rice and an egg, wrapped in blanched cabbage leaves and oven-braised in a tomato-cabbage sauce. My first problem was not blanching the cabbage properly, so that my rolls were difficult and unwieldy to wrap. My second problem was to disregard the instruction to use a skillet (I don't have a top for mine) and using a Dutch oven instead. My third problem was that I apparently have no idea what cooked ground lamb looks like, because after the stated hour and half in the oven, and then an additional hour later, I still had no idea if those rolls were properly cooked or not. No clue. None! For all I know, I had lamb tartare for dinner last night. But! Despite all of these problems, that was one good dinner. The cabbage was sweet and juicy (even if I got fed up with the stiff, not-properly-blanched cabbage leaves, and ended up rolling up only a few rolls), the spiced meat filling was hearty and delicious (even though, because of the aforementioned cabbage stiffness, it meant that I formed largish meatballs with the remaining filling and sort of squashed them down amidst the rolls), and the stewy tomato sauce was the perfect foil for the whole dish (all of which might explain why the accompanying photo to this post doesn't really look like stuffed cabbage at all - it's more like meat and cabbage, stuffed into a pot). I have leftovers and I'm thrilled about it (I've gotten a new job, dear readers, and though I've moved only one block away from my old office, I can't seem to get a grip on my new lunch choices, which I know sounds ridiculous, seeing as I'm just around the corner, but for some reason everything's so much more expensive over here and I don't really know where to go and I'm getting sick of wandering aimlessly only to end up with a spongy baked potato filled with some questionable chili stew that still winds up costing me uncomfortably close to ten dollars, and so! home-cooked it'll have to be, at least for the foreseeable future). Now, should you want to make this and, like me, don't have a oven-safe skillet with a top, or are impatient and don't feel like stuffing cabbage and don't have white-clad German lunch ladies doing so for you, I think you should deconstruct the recipe as follows: cook together the tomato sauce as directed, but add more shredded cabbage and then form the lamb stuffing into marble-sized meatballs which you simmer, covered, directly in that sauce. (in the oven, of course). You'll get the same warm flavors and rib-sticking goodness without the irritation (entirely self-made, I admit) that I experienced last night. And who knows, if enough people eat this for dinner and are inspired to think about school lunch reform, maybe we can actually achieve some progress. If not, at least we'll have had a good meal. 1. Toast the pine nuts in a small dry skillet over medium heat until they are fragrant, about 5 minutes. 2. In a large mixing bowl, combine the pine nuts, lamb, rice, cilantro, cumin, salt, egg, 1/2 cup of wine and pepper to taste. Stir to mix thoroughly, but don't overmix or the rolls will be heavy. 3. Leaving the cabbage head whole, cut out as much of the core as you can. Dip the whole cabbage head in a large pan of boiling water until the outer leaves soften, about 30 seconds. Remove the cabbage from the water, carefully remove those outer leaves and set them aside on a towel to drain. Repeat this process until you come to the inner leaves that are very convoluted and thick. Shred those and set them aside. 4. Meanwhile, in a large skillet with a heat-proof handle, cook the shallots in the olive oil over medium heat until they soften, about 3 minutes. Add the shredded cabbage and cook until the cabbage is wilted and just beginning to brown, about 5 minutes. Add the remaining 1 cup of wine and cook until it loses its raw smell, about 5 minutes. Add the tomatoes and heat through. The sauce should be slightly soupy. 5. Set 1 medium-sized cabbage leaf flat on a work surface with the core end facing away from you. Cut a "V" in the base, removing the tough part of the core. Place 2 to 3 tablespoons of the meat mixture in the "cup" of the leaf at its tip. Roll once, then fold in the sides and continue rolling. Set aside seam-side down. Repeat using all of the medium-sized leaves, then using the larger leaves, cutting them in half if necessary to make consistent-sized rolls. You will probably have some cabbage leaves left over. 6. Heat the oven to 350 degrees. 7. 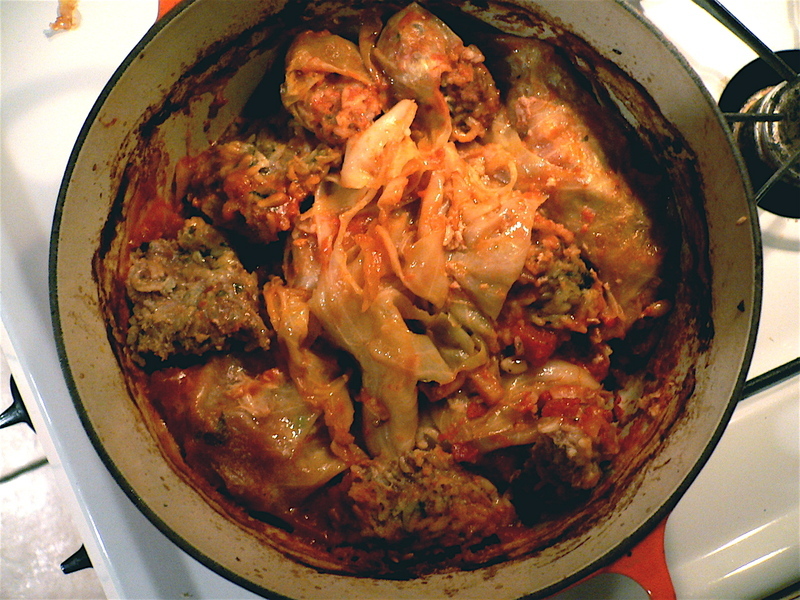 When the tomato sauce is ready, place the prepared cabbage rolls seam-side down in the pan. Go ahead and pack them tightly, and, if necessary, you can even stack one or two on top. Arrange any unused cabbage leaves in a single layer on top of the rolls. Cover the pan with a lid and place it in the oven. Bake until the rolls are thoroughly cooked and fragrant, about 1 and 1/2 hours. 8. Remove the rolls from the oven and let them cool for 10 to 15 minutes. Remove the loose leaves from the top and then carefully spoon the hot cabbage rolls onto a serving platter. Pour the sauce over the top and serve right away.